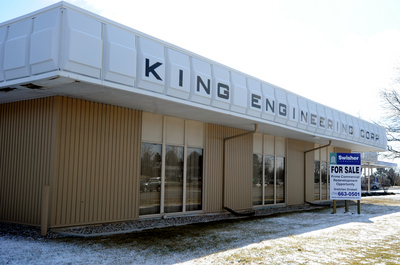 King Engineering Corp., which was founded in Ann Arbor 75 years ago as an offshoot of another local firm, closed its prominent South State Street headquarters on Dec. 31 after the company was sold earlier in 2011. The exodus of King Engineering — which was acquired in July by Newell, West Virginia-based Marsh Bellofram Group of Companies — marks the final chapter for a company with deep roots in the Ann Arbor area. When it was acquired last year, about 13 people still worked for the company, said marketing manager John Gawlas, a former Ypsilanti City Council member. Gawlas continues to work remotely for the company, and another engineer with roots in Florida is also working remotely. The former King Engineering Corp. building is up for sale after the longtime Ann Arbor company was acquired and moved out of Michigan. All other King Engineering employees were offered jobs with Marsh Bellofram in West Virginia, but they all declined transfers, Gawlas said. King Engineering is known to most local drivers as an aging manufacturing facility positioned among modern office complexes and retail developments across from Briarwood Mall. But the high-profile nature of the company’s two-building, 23,322-square-foot complex belies a rich heritage defined by an innovative blend of engineering and manufacturing. Although its former building is outdated and likely to be demolished when a buyer is found, the business itself attracted a prominent buyer: Marsh Bellofram, which is owned by Columbus, Ohio-based industrial holding company Desco Corp.
King Engineering’s liquid level measurement and inventory tank gauging systems are marketed under the KING-GAGE brand and sold to sectors such as the pharmaceutical industry, food and beverage makers and marine businesses. “We look forward to continuing the investment in R&D and manufacturing that have allowed KING-GAGE products to succeed under its prior ownership and more comprehensively supporting the needs of our valued customer base,” said Joe Colletti, Jr., president of Marsh Bellofram, in a December news release. King Engineering was formed in 1937 under the leadership of G.W. Willard, according to Willard's July 2, 1970 obituary published in the Ann Arbor News and archived by the Ann Arbor District Library. Willard had moved to the area in 1923 to lead the sales and service department of a local company called King-Seeley, an auto supplier whose First Street factory closed in the 1980s and was redeveloped as the Liberty Lofts residential complex in 2005. The closure of King Engineering’s local operation came less than a year after the unexpected death of president and part-owner Steve Lefevre. His death “threw the whole company into turmoil” because it had no transition plan and map for future growth, Gawlas said. Consultants advised King Engineering to design a 5-year growth plan to ensure its survival, but board members and stockholders in the private company chose to pursue a manufacturing partner or buyer, Gawlas said. With the company’s acquisition complete, the future of its former complex serves as a reminder of its history. The 2.48-acre property is registered to Kilaco Trust, according to Washtenaw County records. Ann Arbor-based brokerage Swisher Commercial agent Gretchen Driskell, who is marketing the property, described it as a significant redevelopment opportunity because of its proximity to Briarwood Mall, other offices and retail developments. That’s possible in part because the company outlived its land's original zoning designation. It is zoned M-1 — for manufacturing — but the city of Ann Arbor has designated the property as future commercial zone, or C-3, in its master plan. Thu, May 3, 2012 : 12:24 a.m. I appreciate the information. I was wondering what was going on with the company and the folks that worked there. I also worked at King Engineering in the late 1970's and got to know Steve ,his father and family who were part of the company. It was a nice place to work. Let's stop with the negative comments, some has died and our community has lost another person and a small manufacturing company that provided jobs and money to the local area. Fri, Mar 9, 2012 : 7:32 a.m.
Why keep a business in Michigan where union labor has a stranglehold on free enterprise? Thu, Mar 8, 2012 : 10:19 p.m.
Two stories from the person, about the same subject, posted at the same time. What the heck is going on down there? Thu, Mar 8, 2012 : 5:04 p.m.
Maybe another Holiday Inn to join the others in the area? Or some UM parking? Thu, Mar 8, 2012 : 1:22 p.m.
Thu, Mar 8, 2012 : 11:19 a.m.
&quot;...closed its prominent South State Street headquarters on Dec. 31 after the company was sold earlier in 2011.&quot; Thanks for the the two month old news.